Events – "Providing Access to Justice and Equality"
We currently have no events upcoming. 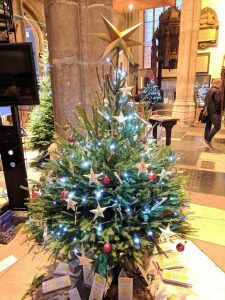 NCLS decorated a Christmas Tree at this years Charity Christmas Tree Festival. The festival, which was supported by Rotary, raised money for Norfolk Blood Bikes which is a charity run by local volunteers that transports blood, plasma, platelets, samples, vaccines, donor breast milk & any other urgently required medical items to hospitals – at night, daytime weekends and bank holidays. On 1st November Lord Willy Bach spoke on ‘The Right to Justice and the Necessity for the Reform of Legal Aid’. We held our second annual Scavenger Hunt on 20th July at the Mash Tun. Nearly 50 people came along and followed the trail around Norwich, answering questions and collecting items to earn points and win prizes. A well earned buffet was provided at the end of the hunt for all participants. The hunt raised over £300 for NCLS, and we look forward to holding the event again next year. Organised by the Eastern Legal Support Trust this years legal walk took place on 15th May. Team NCLS took part in the 10km walk around Norwich to raise awareness adn funds to help plug the gao left be cuts to Government funding. Thanks to those who supported us we raised nearly £400 which will go to support our Free Legal Advice service. This years bake sale was a great success! As well as people dropping in we also provided an order and delivery service to local organisations. We raised a brilliant £196.26 which will go towards supporting our Free Legal Advice service. Thanks to everyone who came along and supported us! Another successful quiz night was held at the Unthank Arms, Norwich which raised nearly £500 to go towards funding our services. On Monday 3rd October the Norwich Cathedral Hostry saw NCLS and Leeway Domestic Abuse Services continue their partnership working to host an important address from the Police and Crime Commissioner for Northumbria, Vera Baird QC. Vera spoke on the topic of accountability within the Police and Judiciary concerning violence against women and girls, and ways in which she is working with agencies in Northumbria to ensure the experience of victims if abuse is improved. 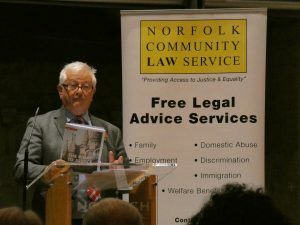 The full audience included the Police and Crime Commissioner for Norfolk, Lorne Green and the chairs of the Norfolk County Community Safety Partnership and Norfolk Safeguarding Boards who sponsored the event. Vera Baird said afterwards: “It was great to have a full house which shows just how seriously this issue is taken by a great range of people in Norfolk. There is a job still to do, particular in rural area. We would be delighted to bring the ideas we have explored in Northumbria, in the hope that they can be taken on, and that we in turn can learn from you”. Many Proctor, Chief Executive of Leeway said “It was a fantastic talk by a truly inspiring speaker. The ideas she expressed were highly innovative and we look forward to working with both her and NCLS in the future”. The first NCLS Scavenger Hunt took place in September and a great time was had by all. £90 was raised to go towards supporting NCLS’s services. Thank you to everyone who took part and supported us. We plan to hold a bigger and better Scavenger Hunt next year so watch this space! Norfolk Community Law Service took part in the Great Legal Bake on Wednesday 3rd February 2016. Staff and volunteers baked savoury and sweet treats to sell at our office on Colegate, with all proceeds going to NCLS. Through this event we made over £125 to help support our Free Legal Advice Service. A big thank you goes to all those who provided bakes and came along to support us on the day. A total of £485.50 was raised at the NCLS Quiz Night on 4th November which was organised by the Supporters of Norfolk Community Law Service. Thank you to those who donated prizes for the raffle and came along, a great night was had by all! Thanks to everyone who attended and made this a very successful event in aid of our parent support pilot at the Family Court. £760 was raised for this important project on a beautiful summery evening. Our special thanks to the Bishop for enabling us to hold the reception and enjoy the beautiful garden, and to Andy Cobb – by day our Money Advisor – who played wonderful summer music for the event.